Last year I found the first Williamsons Sapsuckers (both a male and a female) in Canon City in mid-October. In 2012 I found both a Williamson's and a Red-naped on Sept 22. I found this first of the fall season Williamson's today. 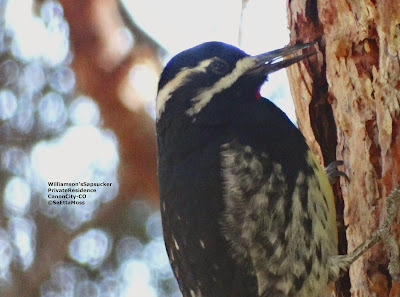 It was feeding on one of the pine trees in a private yard in Canon City where I have found many sapsuckers in previous years. 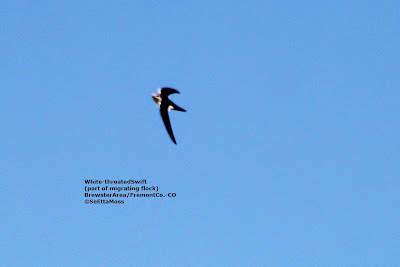 A few days ago I spotted another migrating flock of White-throated Swifts, but this flock was east of Canon City in the Brewster area. Though they appeared to be following the Arkansas River as I have observed in previous years, they had stopped to feed and were foraging up to about a quarter mile from the river. Finally I got a photo of one that shows the eye on one of the swifts. When the Monarch Butterflies had decreased from 10 to 2 at Brush Hollow SWA a few days ago I thought that M3 onarch Butterfly migration was over for south central Colorado. 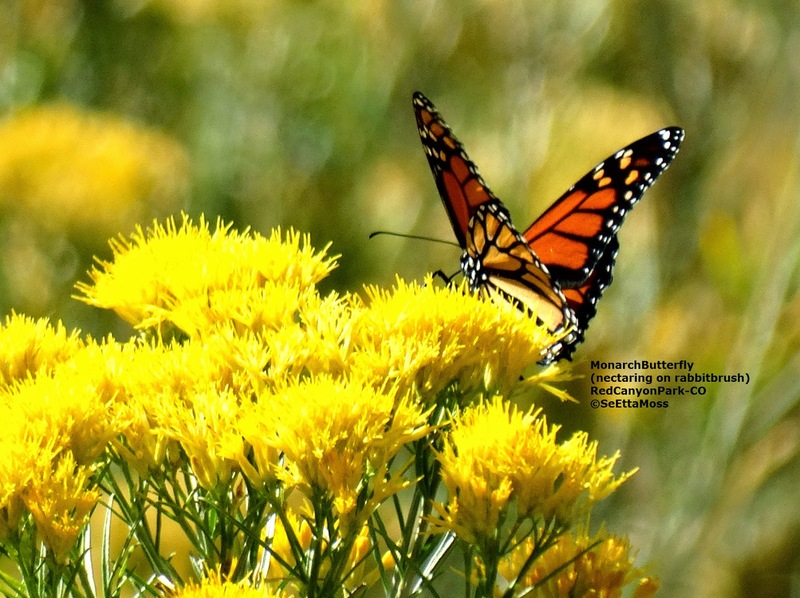 But I was wrong-I found 3 Monarch Butterflies in a large patch of Rabbitbrush at Red Canyon Park less than 10 miles north of Canon City. 3 may not seem like many but this has got to be about the most westerly area that Monarch from the central flyway likely can be found. I have been birding at this park several times over the past week and have checked this Rabbitbrush patch each time for butterflies and this is the first time I have seen Monarch Butterflies there. Red Canyon Park is right up against the foothills, actually the beginning of the foothills that precede the Rocky Mountains in this area of Colorado. (there is a western flyway for Monarch's that is not currently believed to cross to the east side of the Rocky Mountains though research is just beginning).